But by other important measures, it’s awfully expensive to be poor. As Barbara Ehrenreich wrote in her book Nickel and Dimed, many entry-level jobs pay next to nothing with unpredictable schedules. This makes savings, second jobs, affordable loans, and child care all but impossible to arrange. 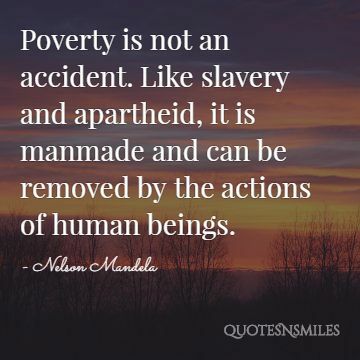 Inescapable poverty changes the way we think about money and time, as short-term concerns glare so blindly that it’s almost impossible to make long-term plans. It’s expensive to be poor, Ehrenreich says. It’s true. In fact, when you don’t have enough money, money itself is expensive. “A mother has been arrested and thrown in jail on charges of child neglect because her 9-year-old daughter was found playing at a park by herself. Ms. Harrell later confessed that she does give her daughter the freedom to play at the neighborhood park while she works at a McDonald’s restaurant to support her family. For her efforts, Ms. Harrell was locked in a cage and her daughter was taken into the custody of the Department of Social Services. The unsupervised play took place at a location specifically designed for children and for safety, and yet it still turned into an incident that may ruin a woman’s life and break apart a family. Perhaps the busybodies would prefer it if the mother unnecessarily lodged her 9-year-old into a daycare center that would absorb most or all of the wages she would earn during the course of a day at work. Or, better yet, quit working and just collect welfare checks.